In the Holy Dzogchen Area there are sixteen meditation retreat centers each of which provides for hundreds of male and female practitioners and are cared for by Dzogchen Monestary masters. In the seventeenth century, the main Dzogchen Meditation Retreat Center was established by Dzogchen Masters Pema Kundrol Namgyal and His Holiness the Third Dzogchen Rinpoche, at the Siltrom Snow Mountain where Padmasambhava had previously meditated. Traditionally, more than one hundred practitioners lived at the retreat center at any one time. These practitioners would stay in retreat anywhere from three years to their entire life. The Dzogchen Meditation Retreat Center's main group practice is the Drupchen Kabgye (the Eight Heruka Mandalas), especially that of Buddha Vajra Kilaya (Dorje Phurba). The Vajra Kilaya mantra is continually recited by groups of twenty-five lamas, twenty-four hours a day. This mantra, with its healing, liberating power, resonates everywhere around the Center. In the early history of the Dzogchen Retreat Center, thirteen Dzogchen practitioners, including Ju Lama Osel, attained Rainbow Body. For one to two years, it consists of the outer and inner preliminary training according to Kunzang Lamai Zhal Lung (The Words of My Perfect Teacher) and other texts. This preliminary training may be repeated three times or more. For one or two years, there are instructions from the Yonden Dzo among other texts, the practice of the outer, inner, and secret Guru Yogas, and the fast path of P'howa, the transference of consciousness. For one to two years, the practices of the First Empowerment, according to the great recitation manuals of Nyingthig and other texts, including the Guru Rigdzin Dupa, Yidam Palchen Dupa, Dakini Dechen Gyalmo, and Dharmapala practices. The Konchok Chindu is always practiced when doing feast ceremonies. All of these ritual practices are based on mandalas. 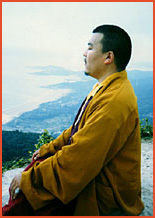 For two or three years, the practices of the Second Empowerment according to the Dzogchen Vima Nyingthik and other texts, including Channel (nadi) Movement meditation, Wind (prana) Holding meditation, Cell (bindu) Variation Meditation with Chandali (tunmo) Fire Meditation and yogic exercises. For two or three years, the practices of the Third Empowerment, according to the Dzogchen Khandro Nyingthik and the introduction of the Six Bardos, among other texts, including Tablam Mahamudra meditation and Bardo Experience meditation. For three or four years, the practices of the Fourth Empowerment, according to the Yeshe Lama, Lama Yangthig, and seventeen Dzogchen Tantras including the highly secret practices of trekchod, togal, and the dark retreat practice. Practitioners who want special training for the development of fearless action will perform four different Chod practices (White, Variegated, Black, and Red Chod), each one hundred times in one hundred different special places. These practices take two to four years to complete. Practitioners who complete these retreat practices become Mahayogis or Mahasiddhas. They may then teach other practitioners, continue to live at the retreat center, or go into solitary retreat. Many famous Mahasiddhas--Ju Lama Osel, Chewu Rigdzin Chenpo, Chod Nyen, and Pema Tsewang, along with many others--achieved enlightenment at the Dzogchen Meditation Retreat Centers. contact your local Dzogchen Shri Singha Dharma center. The Dzogchen Meditation Retreat Centers were destroyed in 1959 and have not yet been rebuilt. This special retreat tradition is almost lost. There are only a few old lamas remaining who hold this unwritten sacred tradition. It is our deepest wish to reestablish the Dzogchen Meditation Centers and tradition. Please help us by contributing. We rejoice in the great merit of your support.